I was unable to find any evidence of Chin Chin playing between November 27th (Thanksgiving) and November 30th. On December 1st, Donna and the Chin Chin cast played in Twin Falls, Idaho. On November 25th, 1919, one of the oddest advertisements I have seen regarding the show ran in the Twin Falls News. It was an announcement “TO THE GENERAL PUBLIC” regarding the show. I did not see any “articles” (really press releases) regarding the show running. 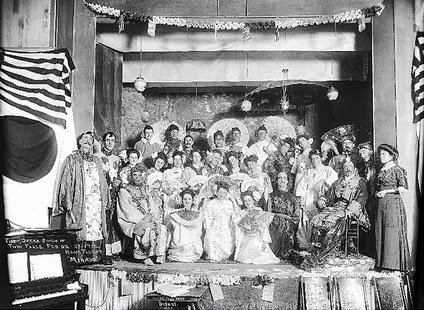 LAVERING–”Chin Chin”, Charles Dillingham’s musical comedy. That’s it. No hype, no review following the show. Very odd, it almost seems that the paper didn’t care about either the show or the theatre. I think the theatre’s history sheds some light on the mystery. 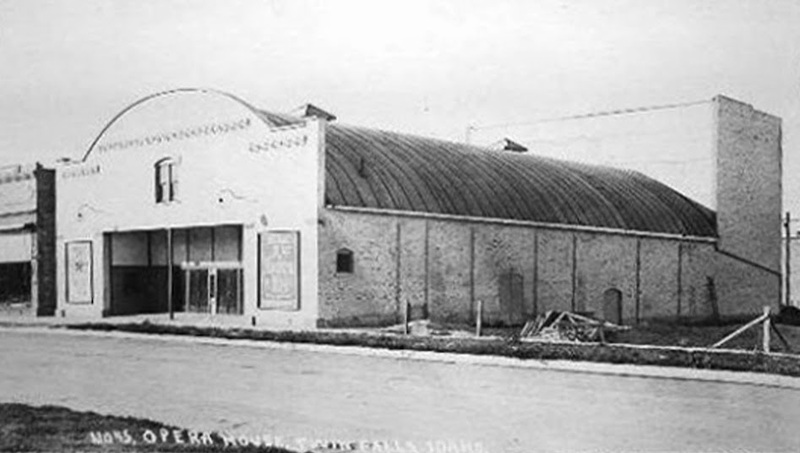 E. C. Lavering built a furniture store in Twin Falls in 1908. Six years later, in 1914, he built an “Opera House” next door to his store. The theater appears to have had a very small stage (see photo) and had little room. (Imagine a curtain call on that stage with a cast of 65.) I’m sure the size, the lack of newspaper hype for its shows, and, probably, the facility itself all contributed to the theatre’s downfall. In 1922, it switched to moving pictures only. 1922 was still the era of silent films, short “talkies” didn’t begin until 1923 and the first feature film didn’t release until 1927 (The Jazz Singer). The theater lasted for only three more years. When it was sold in 1925 the new owners intended to level the floor and remodel it. In 1927 it reopened as a skating rink that was next door to “Danceland.” That business must not have done well either, because in 1928 it and the “Danceland” were remodeled to become a Packard dealership. It remained a car dealership for over thirty years. In 1959 it was remodeled again to make Blacker Appliance and Furniture and Appliance store, which stands today. Oddly enough, this is the only building I know of that Donna played in that is still standing. It has been joined to another building, has had an addition made to the side, and appears to have had the two-story stage area in the back removed, but the basic structure is still standing, 99 years later.